10XBETA - in progress — AE Superlab. Client WIP Portal for 10XBeta Office redesign. Link to latest drawing set here. Link to lighting specs for review here. 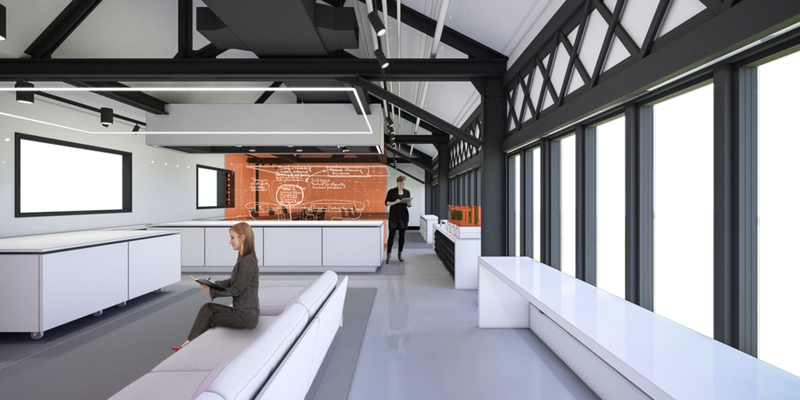 Lighting the space will require a number of complimentary task and environment specific approaches working in unison. These approaches will include general diffuse lighting, targeted downlighting, targeted spot lighting, individual task lighting and “aesthetic” sculptural lighting. 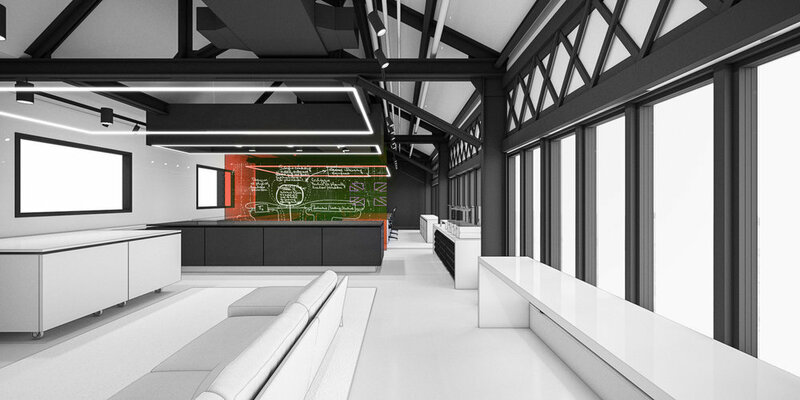 The end result is a space that is uniformly well lit and functional yet playful and bold. Deriving inspiration from the existing “Union Jack” light sculpture, three suspended glowing rectangles provide spatial structure, visual interest and define the functional zones below. In a way the glowing rectangles become a physical representations of an abstract architectural grid. The intensity of the light should be calibrated so as to not significantly contribute to overall ambient light level, but rather act as discreet self-illuminating sculptural elements. 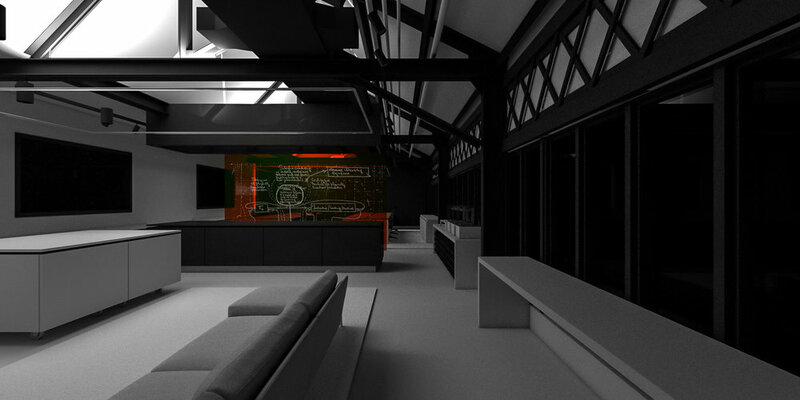 Direct dowlighting is used to provide additional and targeted illumination for worktops and the central lounge area. Smart fixtures to be dimmable and of variable color temparature. Contributes indirectly to overall ambient light level. Track mounted spot lighting provides flexible and tageted illumination of vertical surfaces, mounted artworks, and display items. Contributes indirectly to overall ambient light level. Beam-mounted linear uplights provide diffuse ambient lighting. White painted angled ceiling above reflects light evenly thoughout the space. Dimmable LED fixtures. Together, the various lighting fixtures provide even, diffuse illumination throughout the space, additional, versatile illumination for work zones, in addition to the sculptural lighting elements. The predominantly white/light surface finishes allow for maximum reflection and diffusion of natural light throughout the space, complimented by the various light fixtures as needed based on functional need or external lighjting condition. Various color schemes and combinations were explored. Excessive use of color was avoided in order to provide a flexible backdrop for a multitude of possible functions and so as not to clash with the various products, art objects, and sculptural lighting elements on display. However, a single bright pop of color is provided by the transparent divider/whiteboard. The space is primarily finished in shades of white, while the two end walls are finished in a matte charcoal emphasizing the directionality of the space. 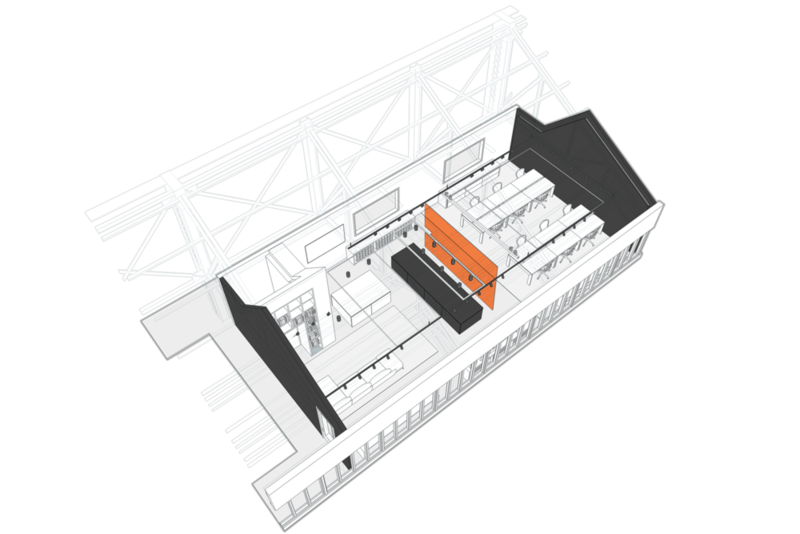 The central work table and the gantry above are both also finished in charcoal to indicate their importance as the working “heart” of the space.